Inmates Said The Drug Burned As They Died. This Is How Texas Gets Its Execution Drugs. Greenpark Compounding Pharmacy gave kids the wrong medicine. It forged documents. Its employees didn’t wash their hands adequately. So why did the state with the most executions hire it to make lethal injection drugs? Greenpark Compounding Pharmacy & Gifts in Houston. The Texas Department of Criminal Justice, which has carried out more executions than any other state, has for the last three and a half years bought drugs for lethal injections from a pharmacy that regulators have repeatedly cited for dangerous practices. The source of the state’s execution drugs has until now been a closely guarded secret. Texas, like other death penalty states, has a law that prevents the disclosure of that information, making it impossible for the public to learn about the manufacturer’s safety record. But documents obtained by BuzzFeed News indicate that one source is Greenpark Compounding Pharmacy in Houston, which has been cited for scores of safety violations in recent years. Its license has been on probation since November 2016, when the Texas State Board of Pharmacy found that it had compounded the wrong drug for three children, sending one to the emergency room, and forged quality control documents. Questions about the source and quality of Texas’s execution drugs have been particularly acute in the past year, since in their final moments of life, five of the 11 inmates who Texas put to death in 2018 said the drug they were injected with, which is supposed to be painless, felt like it was burning as it coursed through their bodies. “I can feel that it does burn. Burning!” Anthony Shore said, his voice rising, as he died in January. Four months later, Juan Castillo swore and said the drug burned and that he could taste it in his throat. In the next few months, inmates Troy Clark, Christopher Young, and Danny Bible all made similar statements as they were dying. A sixth inmate, William Rayford, writhed and shook on the gurney after the drug began to flow into him. Two more inmates are scheduled to be executed in coming days: Joseph Garcia on Dec. 4 and Alvin Braziel on Dec. 11. Want us to report on more stories like this? Join us as a BuzzFeed News member. Compounding pharmacies are not subject to the same stringent federal standards as large manufacturers, and the products they make have a significantly higher failure rate and shorter shelf life, one measured in days, than conventionally manufactured drugs. Attorneys for death row inmates have long warned that compounded pentobarbital could expire or degrade over time, putting their clients at risk of a painful death that would amount to torture. 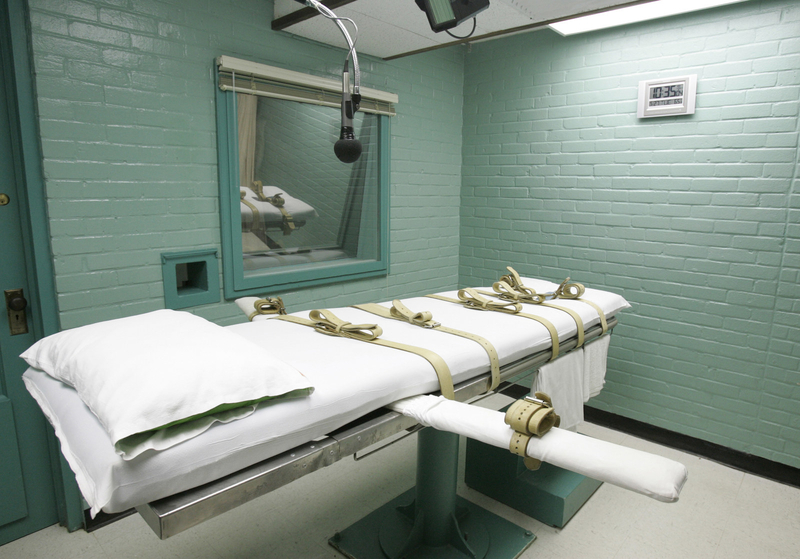 Left: The gurney in Huntsville, Texas, where death row inmates are strapped down for lethal injection. 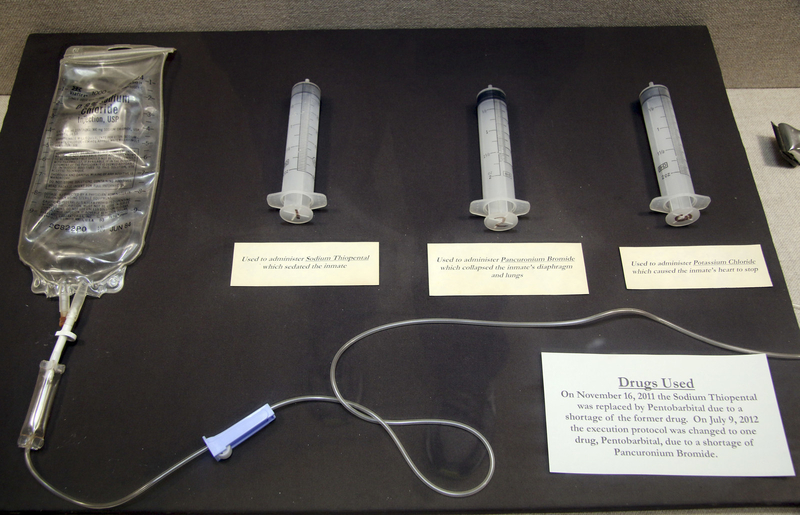 Right: An exhibit at the Texas Prison Museum shows the three-chemical mixture used from 1982 until 2012, when it was replaced by a single drug. In inspections by state regulators, Greenpark has been cited for 48 violations over the past eight years, according to documents obtained by BuzzFeed News. The violations included keeping out-of-date drugs in stock, using improper procedures to prepare IV solutions, and inadequate cleaning of hands and gloves. Federal documents show that in November 2014, the Texas Department of Criminal Justice obtained, from an unnamed source, enough of the raw ingredient in pentobarbital to be used in hundreds of doses. The documents indicate that over the years, the state has transferred fractions of the ingredient to two compounding pharmacies, which use it to produce pentobarbital. The department first transferred 50 grams of the raw ingredient to Greenpark in April 2015, then again in February 2016. The documents indicate the state has not sent any of the ingredient to any other compounding pharmacy since then. The other pharmacy that the documents indicate received shipments of the ingredient (80 grams of it in August 2015) remains unidentified. It's unclear which pharmacy supplied the compounded drugs for each execution, but over the last three years Texas appears not to have acquired the drugs from any other sources. BuzzFeed News shared the documents with two pharmaceutical experts who are familiar with such records. The experts confirmed the methodology behind the reporting. When asked if that meant that the pharmacy, which also operates as a gift shop, does not do it currently or if it has never done so, Hughes said that he had two other calls on hold and ended the conversation. He did not respond to repeated follow-up emails or phone calls. The Texas Department of Criminal Justice declined to comment. It’s unclear how the state selected Greenpark. Of the state’s nearly 200 pharmacies that perform this sort of high-risk compounding, Greenpark is one of only eight that currently have their licenses on probation or revoked. That probation, which is scheduled to expire at the end of this month, was put in place after a pharmacy technician made a mistake in compounding a batch of lansoprazole, a drug that can be used to treat high levels of stomach acid. Instead, the pharmacy gave three children lorazepam, a benzodiazepine similar to Xanax. The state board found that one of the children had to receive “emergency treatment in a hospital after experiencing adverse effects,” and that the pharmacy technician forged quality-control documentation. Without admitting or denying guilt, Hughes agreed to implement new procedures to prevent dispensing errors. The parents of the child who went to the hospital after taking Greenpark’s drugs sued the pharmacy in September 2017. Without admitting liability, the pharmacy settled, agreeing to pay $55,000 toward the child’s college saving fund. Contact Chris McDaniel at chris.mcdaniel@buzzfeed.com.